Miss Charming, a fresh berry/rose which according to the JHG website is “the perfume of a virgin witch”. Does that mean Miss C reinstates my virginity whenever I wear it? I love it when that happens! Lady Vengeance, a gorgeous rose/patchouli with a caramel glaze, and the one that initiated me into the joys of subtle candy-sweetness in perfume. Citizen Queen, a leathery rose that the JHG blurb calls “glamorous and intimidating" - and that’s a pretty good description of this contemporary take on a classic chypre. Click on the perfume names to see my reviews. I have two bottles of Miss Charming, and one bottle each of Lady Vengeance and Citizen Queen (all 1.7 oz). In addition, I have 10 velvet pouches with .07 oz samples of all three eau de parfums. That’s 14 prizes to try for! All Juliette Has a Gun items are courtesy of the friendly folks over at LuckyScent.com. To enter, you must be a subscriber to my YouTube channel, KatiePuckrikSmells. If your Blogger screen name is different from your YouTube name, then please state this in your entry comment. (For instance, my Blogger name is Katie Puckrik, and my YouTube name is KatiePuckrikSmells.) This is important, because the only way I can verify the winners is through their YouTube accounts. Enter by commenting under this post only, stating which perfume you would prefer to win. For example: “Please enter me in the Juliette Has a Gun giveaway. I would prefer to win Miss Charming. My YouTube name is KatiePuckrikSmells.” One entry per person. You can ONLY ENTER by commenting UNDER THIS BLOG POST. Any entries on youtube.com don't count. I’ll try my best to match winners with their perfume of choice. One entry per person, please. Giveaway closes midnight EST July 10, 2009. Winners will be chosen by a random drawing, and announced on this blog on July 11, 2009. Only one prize per winner. mailing address. If I don't hear from you within 2 weeks, your prize will go to a lucky alternate winner. Good luck, Fumeheads - and welcome to my blog! my blogger name is Wonderful Woman and my Youtube name is Carew. Please enter me in the Juliette Has a Gun giveaway. I would prefer to win Citizen Queen. My name on Youtube is Charliwilde, my blogger name is also Charliwilde! Please enter me in the Juliette has a gun giveaway, I would prefer to win Lady Vengeance- a scent I love but can so seldom afford! huge thank yous- and home made chocolate pie for you if Im a winner! My YouTube username is Deanna6, my blogger name is Deanna. My youtube Username is hollisterrox0, my blogger name is Diana. lease enter me in the Juliette Has a Gun giveaway. I would prefer to win Miss Charming. Thanks soo much! P.s. If i win, please contact me on my youtube channel. THANKS! Please enter me in the Juliette Has a Gun giveaway. I would prefer to win Citizen Queen. My YouTube name is laurafayeee. Please enter me in the Juliette Has a Gun giveaway. I would prefer to win Miss Charming. My YouTube name is CatCalamity! 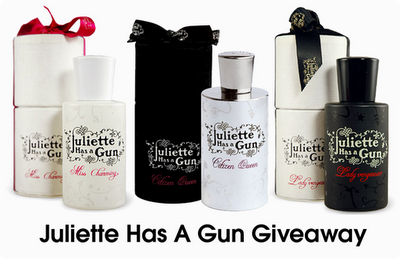 please enter me into the juliette has a gun giveaway, i would LOVE to win Lady Vengeance. Both my blogger name and my YouTube name are Zelzega. Please enter me into the Lady Vengence category. Thank you for holding this giveaway !! My blog name is /lachesis. my YT name is lachesisss. Please enter me in the Juliette has a Gun giveaway. I would prefer to win Lady Vengeance. Hi there! I'm meghan4mark on YouTube. I would love to be entered to win Miss Charming, or if that is gone, one of the sample bags. My YouTube name is OneDollarBuddha. I would prefer to win Miss Charming. I would love to be entered into the "Juliette Has A Gun Giveaway!" For my taste I think that Miss Charming would be a great fit! Please enter me in the Juliette has a Gun giveaway. My YouTube name and my name here is donnellylv. I would prefer to win Lady Vengeance. Enter me please to the Juliette has a gun giveaway:) I would prefer the Lady Vengeance. I have tried to enter this for about 30 minutes now. I have no idea what I am doing wrong. I would love to try Miss Charming in your Juliette Has A Gun Giveaway. Please enter me in the Juliette Has a Gun giveaway. I would prefer to win Lady Vengeance. My YouTube name is NorthSouth89. My youtube user name is cupcakegrl4ever and I would perfer to win Lady Vengence. Please enter me into your special little competition and giveaway! I would love a go at Lady Vengeance please :). My YT name is KimmiPea! Please enter me in the Juliette Has a Gun giveaway. I would prefer to win Miss Charming. Please enter me in the Juliette Has a Gun giveaway. I would prefer to win Lady Vengeance(although I would rather win one of the velvet bags!)! My YouTube name is stargirl937. Thanks so much, can't wait to see more reviews! Please enter me in the Juliette Has a Gun giveaway. I would prefer to win Lady Vengeance. My YouTube name is unluckycharm13. Please enter me in the Juliette Has a Gun giveaway. I would be awesome to win Miss Charming. My YouTube name is FleshEatingFairy. Hi :) My youtube name is Mickysantos and I'd like to be entere in the Juliette Has a Gun giveaway. I'd love to win Lady Vengeance. please enter me in the juliette has a gun giveaway. i would like lady vengeance. my youtube name is makeadriup.. Please enter me in the Juliette Has a Gun giveaway. I would prefer to win Lady Vengeance. I would like to be entered into the contest and I would l-o-v-e to win Lady Vengence! I don't think fate will help me twice, but I can try. I would love to win Lady Vengeance, thank you. Hi there! Love your reviews!! I would be thrilled if you could please enter me in the Juliette Has a Gun giveaway. I would love to win Lady vengeance but would be pleased to win anything, really. Who wouldn't? There was a little confusion about where to post the contest entries. So, the following fumeheads are entered. Please enter me in the Juliette has a Gun giveaway. I would prefer the three sample sizes, my you tube usernameis Saritalaa. Thank you! Please enter me for Lady Vengeance. My youtube name is MarkiSan. Please enter me in the Juliette Has a Gun giveaway. I would prefer to win Citizen Queen. My YouTube name is Kathryncota. Thanks! Please enter me in the Juliette has a Gun giveaway. I would prefer to win Lady Vengeance, and my youtube username is clearserenity84, thanks so much! My Youtube name is cloroxcowgirl and I would love to win Citizen Queen! my youtube name is mightymatanda. please enter me in the contest, id prefer to winn the small sample sizes to try them out. Hi! My name on Youtube is DoEverythingGirl. I would like to be entered in the Juliette Has a Gun contest. I would like Lady Vengeance please! I tried really hard in the last contest, and was unsuccessful, so hopefully I'll have more luck in a random drawing! I would like to win Lady Vengeance (it sounds delish). My YouTube name is the same as all of my usernames, foreverxdirt. So no mix-ups! Thanks for hosting this contest! Good luck everyone! Hello! Please enter me in this giveaway. I would like to win Miss Charming. My username on Youtube is KouUsagi. Please enter me in the Juliette Has a Gun giveaway. I would prefer to win Lady Vengeance . My YouTube name is butterflyglimmer but my blogger name is DeannaB. Thank you! Hi My name on youtube is therealoracle. i would like to be entered in the Juliette Has a Gun giveaway. I would like Lady Vengeance! Please pick me!! Thanks! Hi! My name on youtube is kateFAIL. Hi Katie, my youtubename is Biggan47 and I would like to enter the giveaway. I would prefer to win Miss Charming but I'm a fumehead and I'd love to try any of the JHG fragrances! Please enter me in the Juliette Has a Gun giveaway. I would prefer to win Miss Charming. My YouTube name is LOV3H3RMADLY. Hello so thrilled you have a blog now. I would love any of the fragrances. I'd really like to be entered for the sample bag of all 3. I'm horribly indecisive when it comes to these things, and you have just the remedy lol. My Youtube name is Vixenkitten04. Please enter me in the Juliette Has a Gun giveaway. I'd love to win Miss Charming, but any fragrance would do. My YouTube name is Meriennee. Please enter me in the Juliette Has a Gun giveaway. I would prefer to win Miss Charming. My YouTube name is NatsumiXidnan. I would really love to be entered into the "Juliette Has A Gun Giveaway!" If i were to win, i would prefer Lady Vengeance but would LOVE any of the three! Good job on the blog Katie! Please enter me in the Juliette Has a Gun giveaway. I would prefer to win Lady Vengeance, but any of them would be good. My YouTube name is AleshaDawnP. Please enter me. I'd love to win Lady Vengeance! Hello! I would love to be entered in the contest. I prefer 'Miss Charming,' but any would be a delight to win. My youtube username is alainaisawesome. I would prefer "Lady vengeance". My youtube username is drakendrones. I would like to enter into the Juliette has a Gun giveaway. My youtube username is aleksXbabesz. It does not matter which one it is but if I had to choose one, I would choose Miss Charming. Please enter me in the giveaway! My youtube name is TheCheetoBandit. I would prefer to win Lady Vengeance. Thank you! Congrats on the fabu blog!!! I think I'd prefer to win "Miss Charming," but really they all sound delicious. Hi Katie! Please enter me in the contest. My youtube name is befany14. My youtube name is BeautyDu. Please enter me in the contest! Any of them would be fine. My youtube name is skids1805. my youtube name is blakciwthenvy702. I would like to win any they all sound amazing. thanx for entering me. I'm entering the contest, olé! My Youtube name is vidabo. Great way to announce the blog. Thanks and good luck to you and all of us. Oh, if I get drawn, I'd love some Lady Vengeance. Please enter me in the Juliette Has a Gun giveaway. I would prefer to win Lady Vengeance. My YouTube name is Spiritfingers186. Hey Katie, I would love to be entered into your Juliette Has a Gun giveaway. I would like to win Citizen Queen. Please enter me in the Juliette Has a Gun giveaway. I would prefer to win Citizen Queen. My YouTube name is AppleCopasetic. Please enter me in the Juliette Has a Gun giveaway. I would prefer to win Citizen Queen or one of the pouches, if Citizen Queen has been taken. My YouTube name is gabby14333. Please enter me in the Juliette Has a Gun giveaway. I would prefer to win Lady Vengeance. My youtube name is oksanakapeniak. Hi Katie. Please enter me in the Juliette has a Gun giveaway. If I win, I'd love Miss Charming. My youtube name is louise7401. My YouTube name is "xTenshiko." Please enter me in the Juliette Has a Gun giveaway. I would like to win Citizen Queen. My YouTube name is "sonyawinder"
Please enter me in the Juliette Has a Gun giveaway, I would like to try the Citizen Queen or all three sample sizes... My YouTube username is HowDoIFortune. Thank you! Please enter me in the Juliette Has a Gun giveaway. I would prefer to win Miss Charming OR Lady Vengeance. My YouTube name is razzberry06. Thanks! Keep up the great video reviews! Please enter me in the Juliette Has a Gun giveaway. I would prefer to win Citizen Queen. My YouTube name is ExcellentGerwa. Please enter me in the Juliette Has a Gun giveaway. I would prefer to win Miss Charming. My YouTube name is margho99. Thanks. Hi Katie, please enter me in the Juliette has a Gun giveaway. I would love to try the Lady Vengeance fragrance. Please enter me in the Juliette Has a Gun giveaway,i would prefer to win Miss Charming ! Please enter me in the Juliette Has a Gun giveaway!!! I would prefer to win Lady Vengeance ^_~ My YouTube name is mysteryfangirl. I love the new website. Please enter me in the Juliette Has a Gun giveaway. I would prefer to win Miss Charming. My youtube name is karatechess23. On youtube I am xxvanillacandycane. Love your reviews and biting wit! I would prefer Miss Charming or Lady Vengeance. My youtube name is venusapollo. Please enter me in the Juliette Has a Gun giveaway. I would prefer to win Lady Vengeance. My YouTube name is azzianmomma. I'm lemming Miss Charming and Lady Vengeance, but your reviews have spiked my curiosity about all 3. My YouTube name is soflyashley. Please enter me in the Juliette Has a Gun giveaway. I would prefer to win Miss Charming. My YouTube name is pyrokitsune1. Please enter me in the Juliette Has a Gun giveaway. I would prefer to win Miss Charming. My YouTube name is junepeachie. my youtube name is doriosity as well. If I posted an entry already can you please delete/ ignore it. When I reloaded the page, my comment didn't show up. Thanks. Please enter me in the Juliette Has a Gun giveaway. I would prefer to win Citizen Queen. My YouTube name is meadow227. Thank You! Hey my blogger name is Roxy but my youtube account is chyld. Hey there =] Please enter me in the Juliette Has a Gun Giveaway. I would really like to win Miss Charming. It seems like it would be lovely. My Youtube name is breebuh! Thank you for the giveaway opportunity. Please enter me in the Juliette Has a Gun giveaway. I would prefer to win Citizen Queen. My YouTube name is 3plo. Hi pretty! Please enter me in the Juliette Has A Gun giveaway! I would love to try Miss Charming but really any of the 3 would make my day!! My YouTube name is NerdatHart! Please eneter me in the Juliette Has A Gun giveaway. I'd love to try Miss Charming but really any of the 3 would make my day! Please enter me in the contest! I would prefer Citizen Queen. My username is suddenlyIsee18 on Youtube. Thanks! Hi Kaite! i would like to win Lady Vengeance please! ^_^ keep on smellin'! I've won before in one of your giveaways. I'd really like to try my luck again for this fragrance as I love the smell of roses. My YouTube name is 1piscesish. Hi :) my name is Danielle, please enter me in the Juliette Has a Gun giveaway, I would love to win Citizen Queen. my Youtube name is andshewasthemuse. Thanks. I would like to enter the contest, for lady vengeance, but I wouldn't mind winning any of them. Please enter me in the Juliette Has a Gun giveaway. I would prefer to win Miss Charming or Lady Vengence. Please enter me in the Juliette Has a Gun giveaway. I would prefer to win Miss Charming. My YouTube name is pinkplease. Hi Katie! Love your reviews on youtube and I am a recent subscriber. I don't know much about women's perfumes so your reviews really help me with gift ideas for the women in my life. Please enter me in the Juliette Has a Gun giveaway. I would prefer to win Lady Vengence. My YouTube name is atlas407. My Youtube account name is BlueStarsHalo, Please enter me in this great Juliette Has A Gun Giveaway. I would prefer the sample pouch of all three scents. What a great way to kick off the month of July! I would prefer to win Lady Vengeance. My Youtube name is kathe58. I'd love to enter the contest to win Lady Vengeance. My youtube name is Miriam89. Hi Katie! My youtube name is yabelet1 and I'd love to enter in this givaway. I would prefer Lady Vengeance. I am Lize, aka LIEHIEZE on Youtube. Last year I was in a store, and I smelled the Juliette has a gun fragrance in Miss Charming. hi katie, please enter me in the Juliette Has a Gun giveaway. I would love to win Lady Vengeance. My YouTube name is emmacollinsdesign. Good luck to everyone! thank you! Hi Katie, Please enter me in the Juliette Has a Gun giveaway. I would prefer to win Miss Charming. My YouTube name is blackjadestone. Thanks! Please enter me in the contest, my youtube name is mpicky. I would prefer to win Lady Vengance. Thank you! Please enter me in the Juliette Has a Gun giveaway. I would prefer to win Lady Vengeance. My YouTube name is BarbieBia. Please enter me in the Juliette Has a Gun giveaway. I would prefer to win Miss Charming. My YouTube name is kreativekaren. Please enter me in the Juliette Has a Gun giveaway. I would prefer to win Miss Charming. My YouTube name is highonsugar25. Please enter me in the Juliette Has a Gun giveaway. I would prefer to win Miss Charming. My YouTube name is xluvsanya. Please enter me into the giveaway drawing! My YouTube username is; mimzywhimzy, and I would LOVE to win Citizen Queen! Thank you, and congrats on the faboo new blog!! My youtube name is the8bitninja and I would enjoy winning Lady Vengeance! Please enter me in the Juliette Has A Gun giveaway contest. I would love to own the Miss.Charming perfume. My YouTube name is SmokeyStars742. Please enter me in the Juliette Has a Gun giveaway! I would prefer to win Lady Vengeance. =) My YouTube name is Pullupyoursockslove. Hi, please enter me in the Juliette HAs A Gun giveaway contest. I prefer to win Lady Vengeance. Hello, could you please enter me into the Juliette Has a Gun giveaway? I would prefer to win Miss Charming, if possible. Please enter my in the Juliette has a gun giveaway? I'd love to win Miss Charming. My youtube name is cathurnx3. I would love to be entered in your drawing. I would prefer Miss Charming if I win. My youtube name is JWpianoboe. Hi! Please enter me in the Juliette has a Gun drawing! I would really love a bottle of Citizen Queen which is amazing! Hello, please enter me too as I really like this line. I'm lognorupa on youtube. I wold love to be entered for Lady Vengeance. Thanks! How exciting that you are launching the blog! I am dellse1 on youtube. I think that citizen queen or the sample pack would be cool. Thanks! Thank you for being so generous and best of luck with the new blog! Hello, Please enter me in the Juliette Has a Gun giveaway. I would prefer to win Miss Charming. My YouTube name is Stacey98761. I'd like to enter into the Juliette Has a Gun contest, and I would prefer to win Miss Charming. My YouTube name is also xivorydustx. Hello Katie, Please enter me in the Juliette Has a Gun giveaway. I would prefer to win Lady Vengeance . My YouTube name is LadyUnintended. Thanks for the giveaway. Please enter me, I would love to win Miss Charming. youtube name is onetimejames. My lj is openlyhidden, my youtube is neotsukihime. Please enter me in the Juliette has a gun drawing. I would prefer Miss Charming, but of course would be thrilled with any of the prizes. My Youtube username is "persianbilli"
Please enter me in the Juliette has a gun drawing!! I would prefer Miss Charming but anything is fine! My youtube name is asweetnshortworld.